"IT'S ALL ABOUT MY CLIENTS!" The following qualifications are not simply handed out with a real estate license, but instead have been developed through hard work, study, experience and dedication to the Amercian dream of home ownership. Licensed Real Estate Broker. Deborah has achieved the highest level of education and licensing a real estate professional can obtain in the State of California. 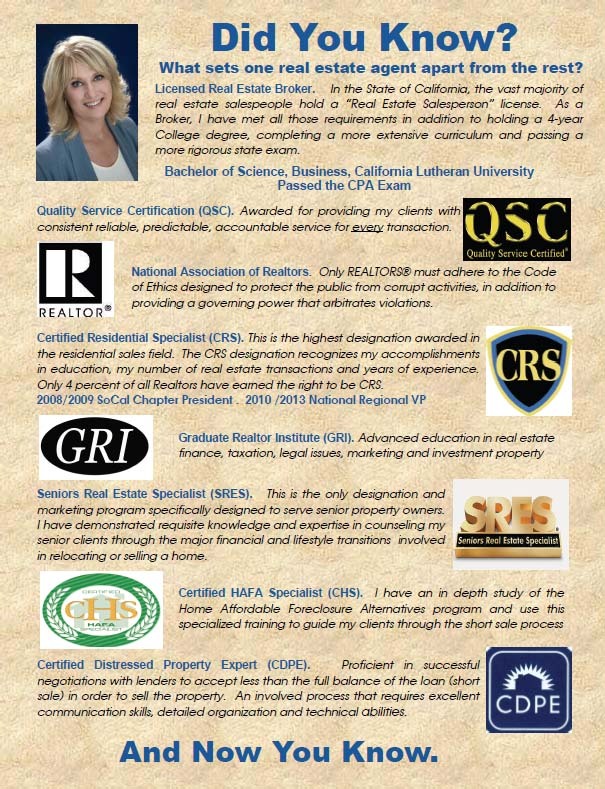 Certified Residential Specialist (CRS). Credential awarded for accomplishments in the number of real estate transactions; number of years experience and education. Only 5% of all Realtors have earned the right to be called a CRS. Graduate Realtor Institute (GRI). Advanced education in real estate financing, taxation, legal issues, marketing and investment property analysis. Seniors Real Estate Specialist (SRES). Designated member of this program designed to meet the special needs of America's fastest growing segment of property owners-Senior Citizens. Quality Service Certification (QSC). Awarded for providing her clients with consistent reliable, predictable and accountable service for every transaction. Cutting Edge Technology. Deborah remains within the top 1% of all Realtors in the nation technologically. This means the absolute best in new marketing techniques for her sellers and better inventory and strategies to share with her buyers. She has the skills and makes the expenditures that are necessary to stay months/years ahead of typical agents. National/International Relocation. Whether moving to another city or out of state, Deborah can refer you to a highly qualified real estate professional in your new area. Former Tax Accountant for Arthur Andersen & Co., passed CPA Exam. Deborah understands the tax consequences of real estate transactions and can work in a knowledgeable way with your tax accountant to provide you with properties that make sense for your current financial position and long term goals. Put Deborah's Negotiation Expertise to Work for You. This experience in negotiating and investing is not handed out with a real estate license. Provides a Support Team that works to get your escrow closed in a timely and cost efficient manner. Full Time Professional Real Estate Service. Selling properties and finding the best buys for her clients requires a full time commitment.